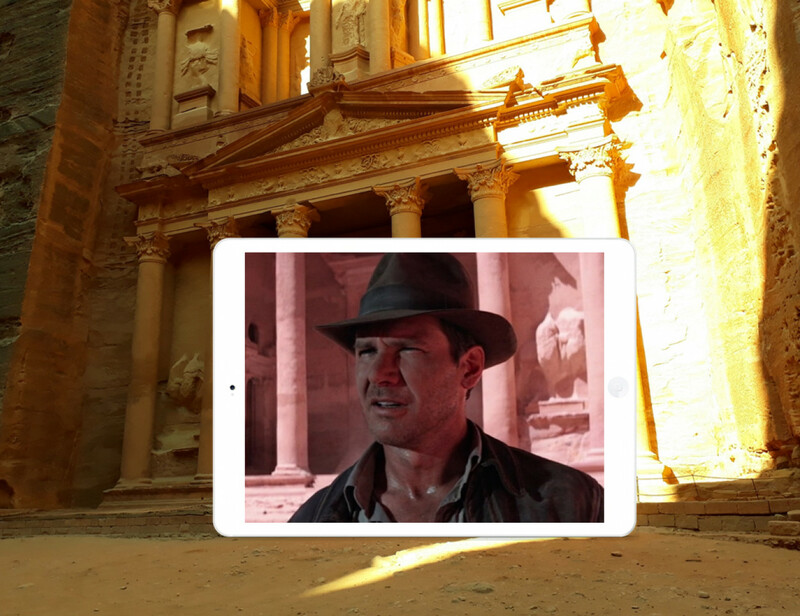 Almost three decades ago, George Lucas decided to use the monumental Treasury, the centrepiece of Jordan's ancient Nabataean city of Petra, as the exterior of The Temple of the Sun in his movie Indiana Jones and the Last Crusade. This meant that cast and crew had to travel all the way to Jordan for just one day of shooting, because that's all it took to make those scenes work. While the filmmakers were allowed to have free access to the main entrance chamber, access is prohibited to most mortal visitors. The good news is that the most spectacular part of the location is its exterior - as well as the path you need to take to get there in the first place. The 1.2 kilometre long walk through a cleft called The Siq builds anticipation for a location where the first glimpse of the facade of the Treasury can only be spotted 50 metres before the end. The shot below is a popular photograph in numerous guidebooks and it is fair to say that this sight is simply spectacular. Surely, Indy and his friends would have had the same thought. For more inspiration, check out our story about Stefan's visit to Petra in July 2017. Indy, his father and their friends Sallah and Marcus Brody have discovered the Canyon of the Crescent Moon, allegedly the hiding place of the Holy Grail. On horseback, they make their way through the narrow gorge that leads them deep into the mountains until they reach the Temple of the Sun. 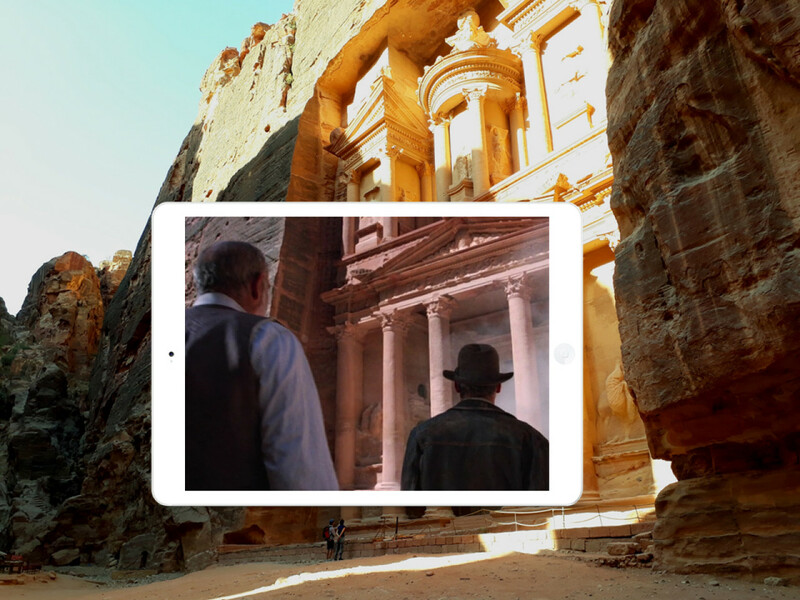 The very moment when Indiana Jones, his father Henry, Sallah and Marcus Brody reach the Temple of the Sun. ...and carefully approach the entrance. The following interior scenes - the encounter with Indy's former lover Elsa and the Nazis, as well as Indy overcoming the three challenges to find the Holy Grail - were all shot in a studio. As we know, Indiana Jones succeeds in finding the grail, yet, it cannot leave the temple. Overwhelmed by temptation, Elsa carries the grail over the seal and the temple starts to collapse. Only Indy and his friends make it out alive. A horrified Indy has to witness the destruction of the Temple of the Sun but his dark thoughts are interrupted by his father:"Elsa never really believed in the Grail. She thought she'd found a prize." Indy:"What did you find, Dad?" If you are visiting Petra it pays to rise early and get to the ticket office as soon as it opens at 6am. It's a good way to avoid the crowds and enjoy the rays of the morning sun slowly wandering down the facade of the Treasury. Apart from the walk through the Siq, there is hardly any shade in the valley so bring a sunhat and plenty of sunscreen. The Beduins have set up numerous stalls and you can buy cheap bottled water everywhere. Don't miss out on the hike up to the Monastery (Al-Deir). It's every bit as spectacular as the Treasury, if not more so. Be warned though: the climb takes about one hour each way and you will have to negotiate around 850 steps. If in doubt, you can hire a donkey that comes with a guide. The Monastery also features in the Hollywood blockbuster Transformers: Revenge of the Fallen. For more tips on your visit, check out our story about Stefan's visit to Petra in July 2017 or the official website of the Petra Development and Tourism Regional Authority.